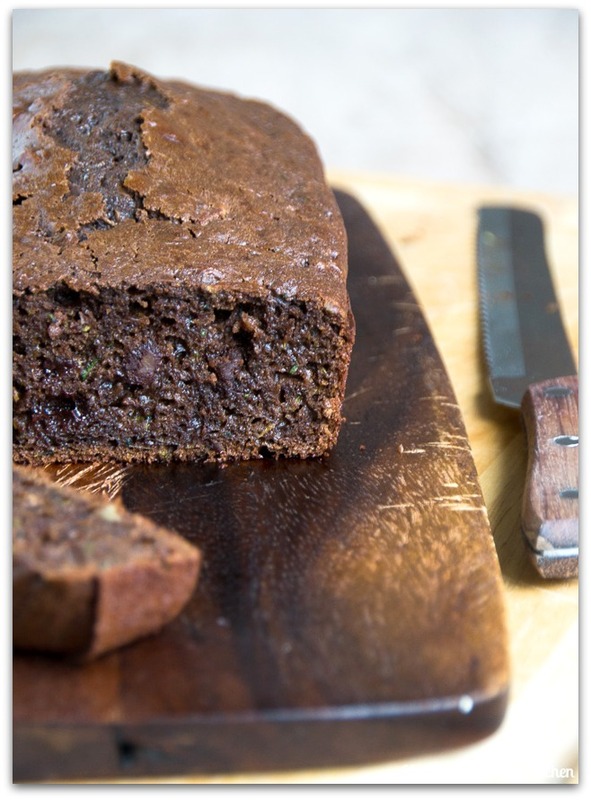 When I first saw recipes for zucchini bread floating around, I immediately wanted to try it because I was so curious about the taste. To my surprise, the zucchini doesn’t really taste like anything in this bread, which is probably a good thing since I love the rich chocolate flavor. It does, however, make the bread incredibly moist! I used a 5-star recipe I found in Cooking Light magazine, but made some changes (for example, I didn’t have applesauce so I used buttermilk instead). I also decided to omit the cinnamon, but I can imagine it must taste delicious with it included. I hope you enjoy this bread as much as I did! 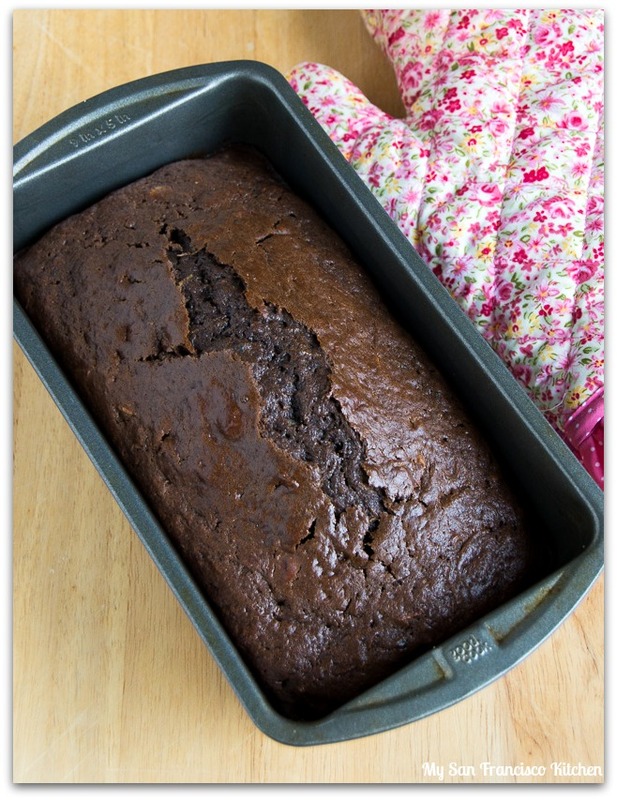 Spray a 9x4-inch loaf pan with cooking spray and set aside. 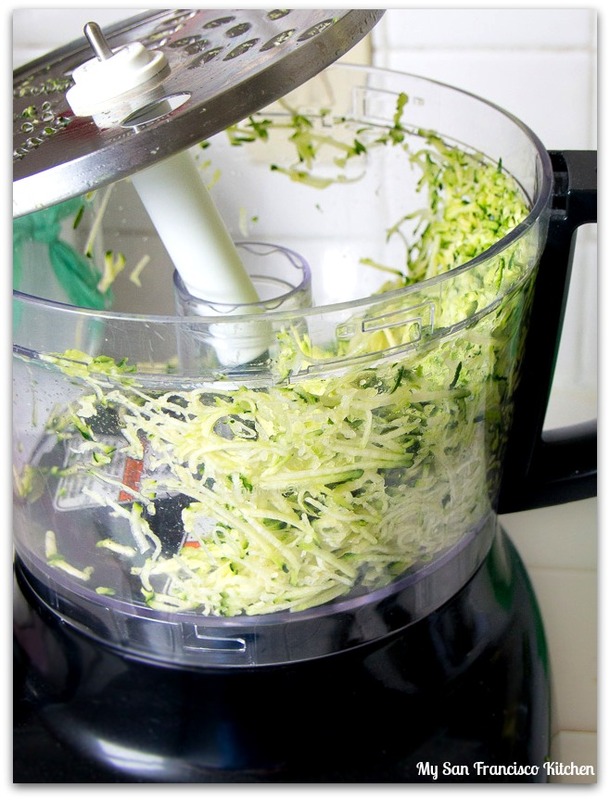 Finely shred the zucchini by hand or using a food processor, and gently press out the excess water. In a mixing bowl, stir together the buttermilk, oil, eggs, sugar and vanilla. 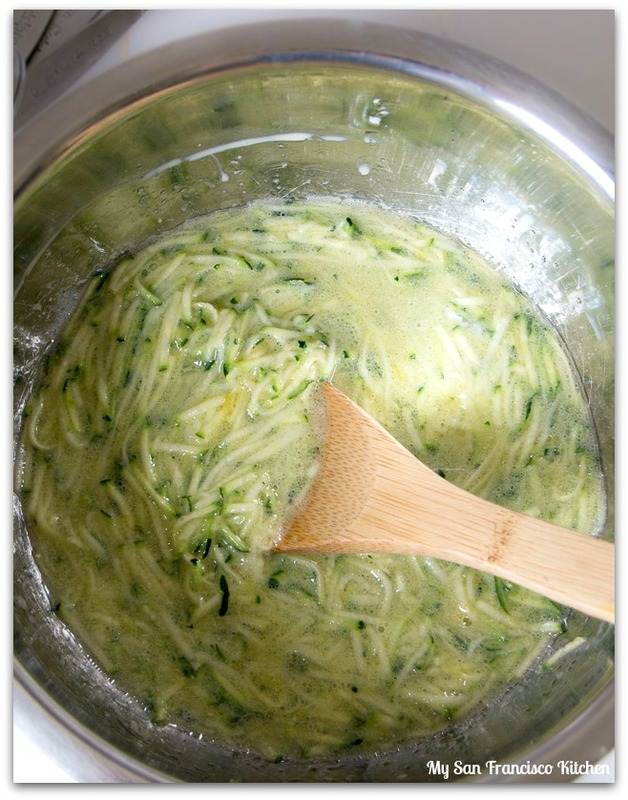 Add the zucchini and stir. In a separate bowl, combine the flour, cocoa, baking powder, baking soda, and salt. Gradually add the flour mix to the batter, stirring in-between, until all is added. 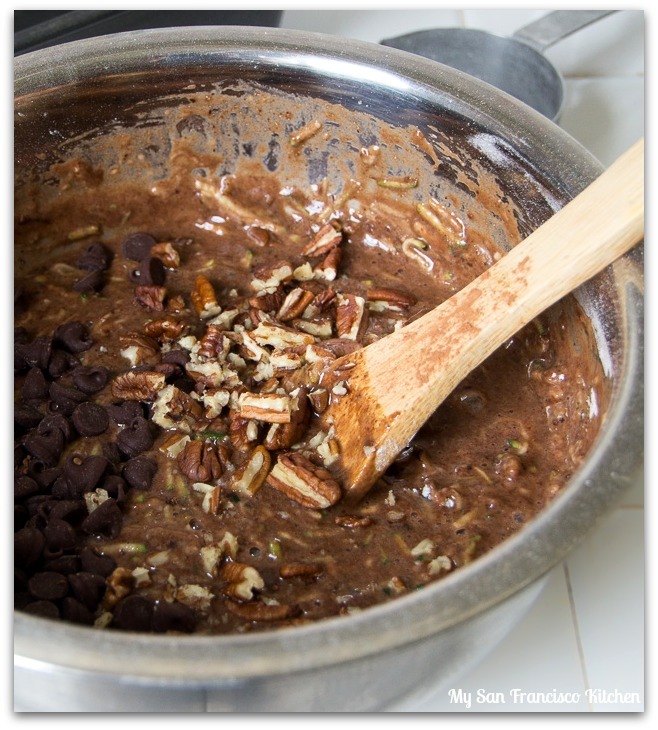 Stir in the pecans and chocolate chips, then transfer to the loaf pan. Bake for 1 hour, until a toothpick comes out dry. Let cool in the pan for 10 minutes, then transfer to a wire rack to cool until ready to serve. Wrap with plastic wrap and keep in the refrigerator for up to 3 days for best freshness. This entry was posted in Bread, Chocolate, Dessert and tagged bread, chocolate, pecans, zucchini. 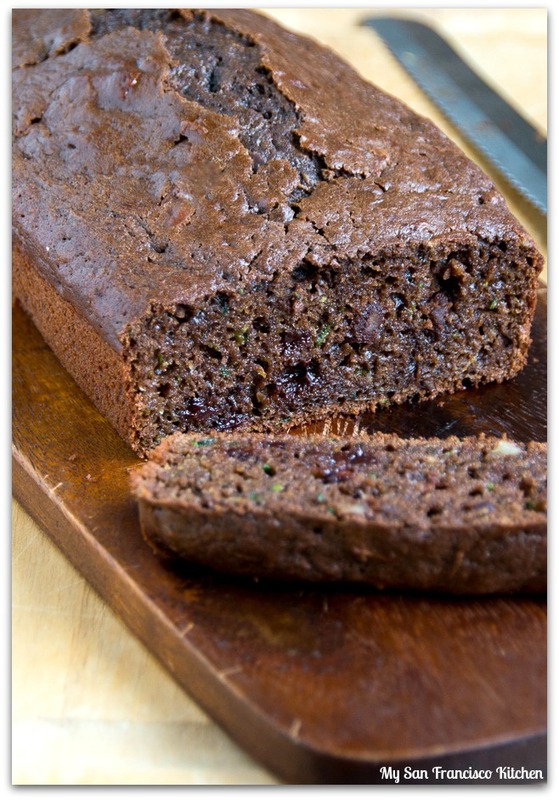 ooooh I’ve been wanting to try the whole baking with zucchini & chocolate thing-and this bread is def. making me extra anxious! So dense and moist and chocolatey! 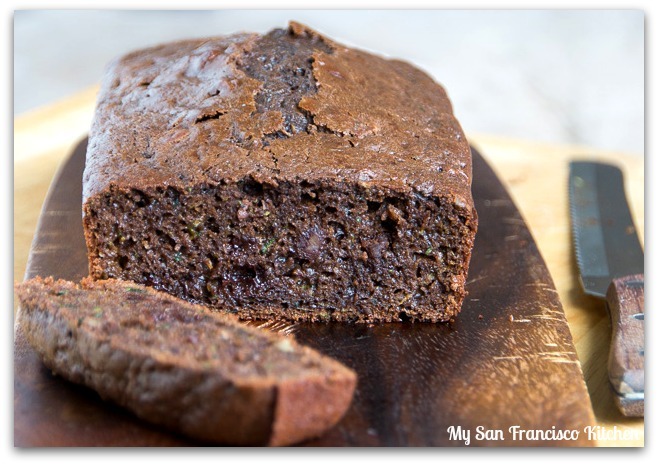 I’ve had plenty of zucchini bread, but never with chocolate. Love the idea! And good for you for battling caffeine. I love the stuff, but I limit myself to no more than 2 cups of tea a day so I don’t have problems. I just found your blog and love it and I love San Francisco. I live in Santa Cruz. Awesome, I love Santa Cruz!! I would love a slice of this or 2 to go with my morning tea. Packed with chocolate and moist! As for those headaches they are horrible. I had a migraine for 3 weeks when I quite last time. I also have one everyone in awhile but limit to no more than 2 day. I can’t even think of having to withdraw from it again. Oh my good luck.